Think your beard is the best? You won’t know for sure until you enter a beard competition. During these fun events, beard growers from all over the world go head to head to find out who has the biggest, longest, or most elaborately styled beard. While most of these competitions are charity events and don’t offer huge cash rewards, they do offer something better – bragging rights. They also give you a chance to show off your creative side, have fun, and in many cases, help out a good cause at the same time. There aren’t many rules. Unless the category has the word “natural” in it, the use of styling tools like beard balm and waxes is encouraged. Before entering, you should know a thing or two about the different beard styles, how to shape a beard and how to trim a beard. But if you’d rather just watch, you’ll be happy to know that most of these competitions are full-fledged events with plenty of entertainment, vendors, food, and family-friendly activities. So without further ado and in no particular order, here are the top 10 beard competitions. 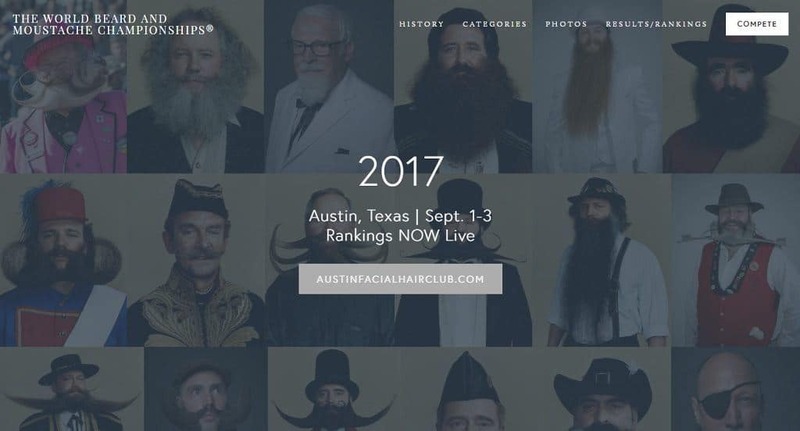 Once a year, hundreds of men (and a few women) come to compete for the title of best beard in the USA, and thousands of spectators come to watch. The event is hosted by Beard Team USA, a national beard club that represents the country in global competitions. A portion of ticket sales goes to benefit a local charity from the venue city. Who Can Enter: Anyone with facial hair is allowed to register, and no beard club membership is required. Categories: There are 18 categories total, including best Dali mustache, best English mustache, best Fu Manchu mustache, best natural chevron mustache, best sideburns and best full beard. Awards: The grand prize is an all-expense-paid trip to next year’s competition. 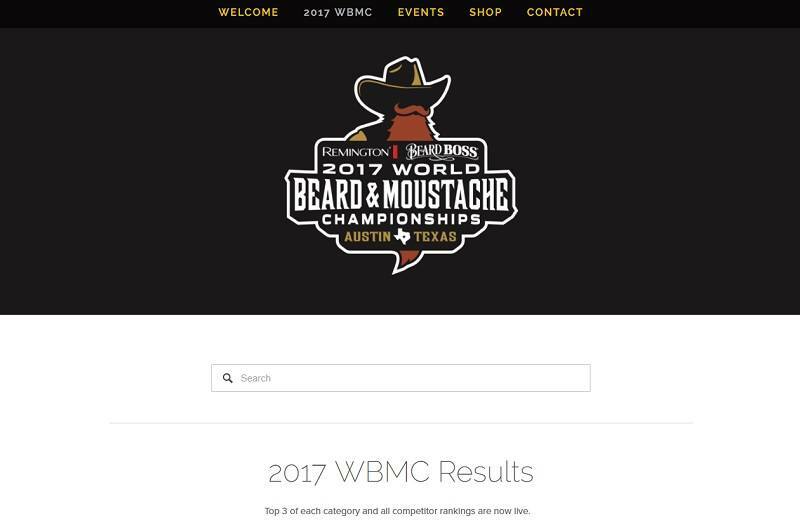 The World Beard and Mustache Association (WBMA) hosts the World Beard and Mustache Championships, a biennial competition in which the best of the best compete for the title of World’s Best Beard. These beards are the best of the best – no other competition is as large, prestigious, or as well-known – so there’s no room for amateurs. 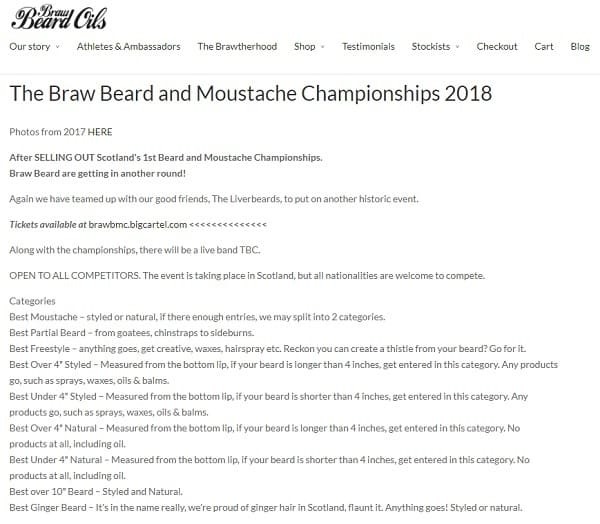 Who Can Enter: Anyone with facial hair can apply for entry, but Beard Team USA membership is preferred for participants from the United States. Categories: There are 16 different categories that are split into three groups – mustaches, partial beards, and full beards. In addition to freestyle categories, specific style categories include the best Hungarian mustache, best handlebar mustache, best goatee, and best Verdi beard. Awards: A shiny plaque, international news coverage, and the right to brag about winning the world’s largest beard competition! 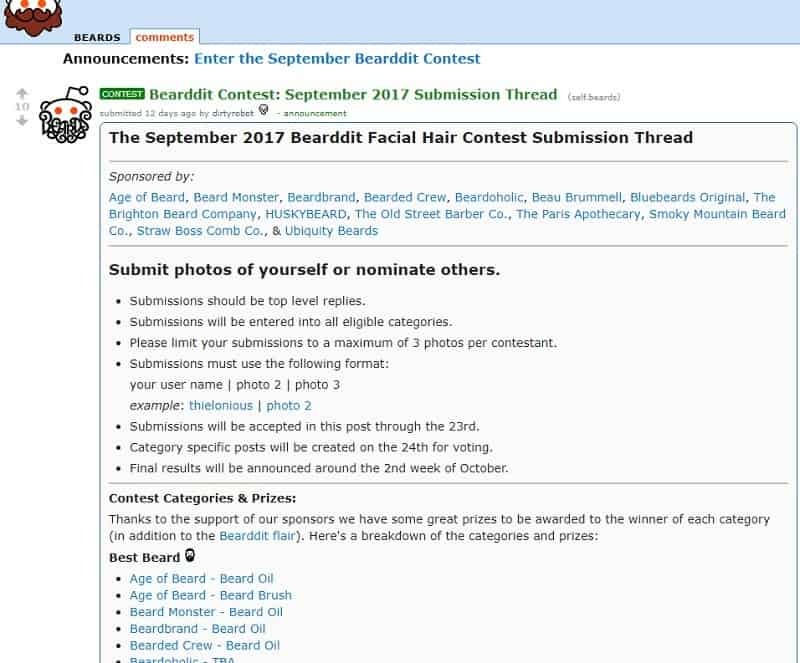 Easily the most accessible beard contest in the world, Reddit’s monthly beard contest is a great way for those new to the competitive scene to get their feet wet. Photos are judged and voted on by an active community of beard enthusiasts in the end of every month. Who Can Enter: Anyone can submit a photo of their beard once per month. Categories: Best beard, biggest beard, best mustache, and biggest mustache. 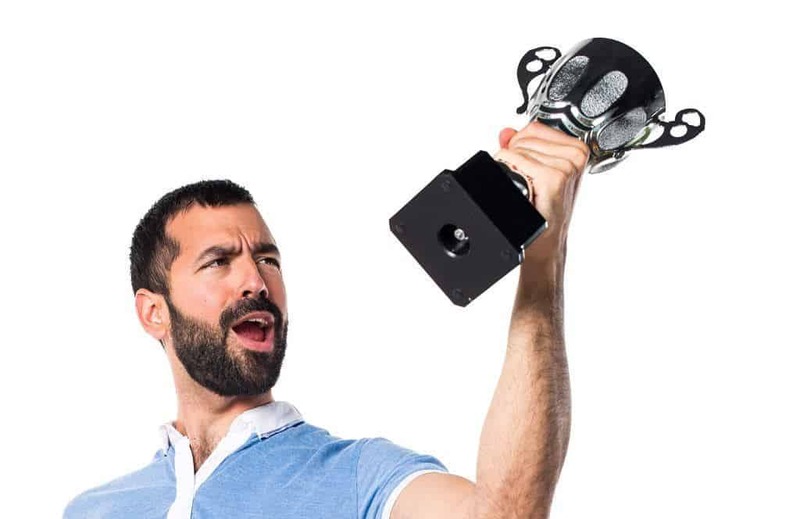 Awards: The winner in each category receives a variety of beard care products, which include some of the best beard wax options, beard oil, brushes, and balms from vendors across the country. Beards and motorcycles go together like peanut butter and jelly, so it’s no surprise that the annual Sturgis Motorcycle Rally also hosts a beard competition. It’s a small, local competition, with only 15 contestants per category, but it’s no less exciting to watch than a large, national event. Who Can Enter: Anyone with a beard or mustache who attends the rally can enter. Women can even enter to compete in the “Whiskerina” contest. Categories: Prizes are awarded to the best full and long beards, short and full beards, the best-styled mustache, and the best full beard with a styled mustache. Awards: The grand prize winner automatically qualifies for the next National Beard and Mustache Contest. 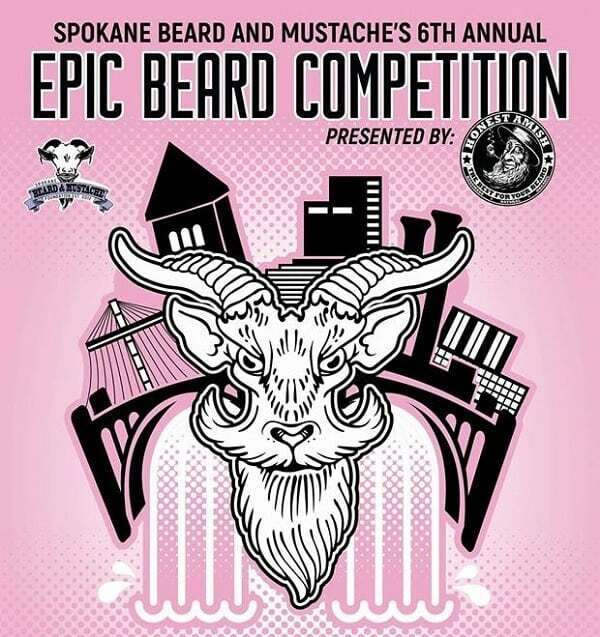 Spokane Beard and Mustache is a charitable organization that hosts the Epic Beard Competition once per year. Part competition and part fundraiser, the annual event is great fun for a great cause. Who Can Enter: Anyone with facial hair can enter – the ticket price for competitors starts at $20, with a maximum of 40 contestants per category. 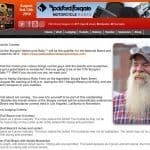 Categories: There are 12 different categories, including best “business beard”, best partial beard, the best full beard, and most creative beard, real or fake. Awards: Because the event is for charity, the winners don’t receive cash or physical prizes – just that warm, fuzzy feeling that comes with doing something good for the community. 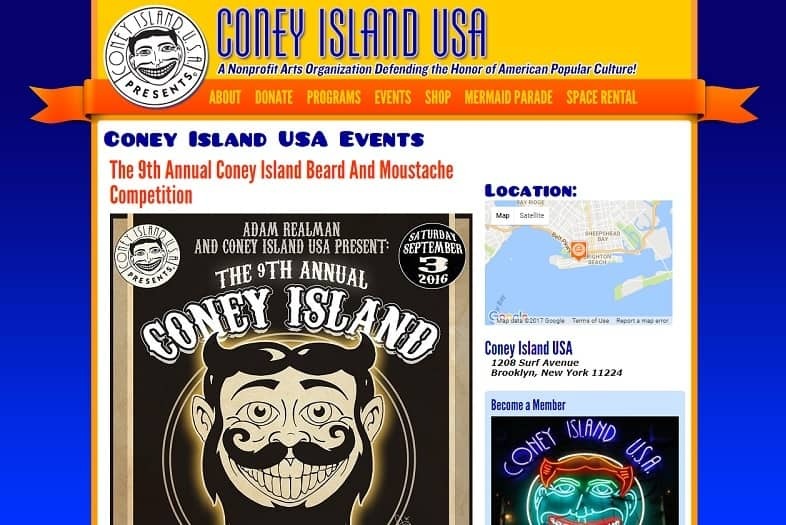 Once a year for the past 10 years, Coney Island lets its freak flag fly a little higher than usual when they host their annual beard and mustache competition. The delightfully and appropriately themed carny affair is fun for the whole family. Who Can Enter: Anyone with a beard or mustache is eligible for entry – tickets are $20. Categories: There are categories for the best natural and best-styled mustache, beard, and partial beard. In addition to the typical “best” categories, there is also a “worst in show” category. Awards: The winner of each category receives a coveted Coney Island fez. A beard contest that takes place at a brewery has got to be good, and the Braw Beard and Moustache Championships are no exception. 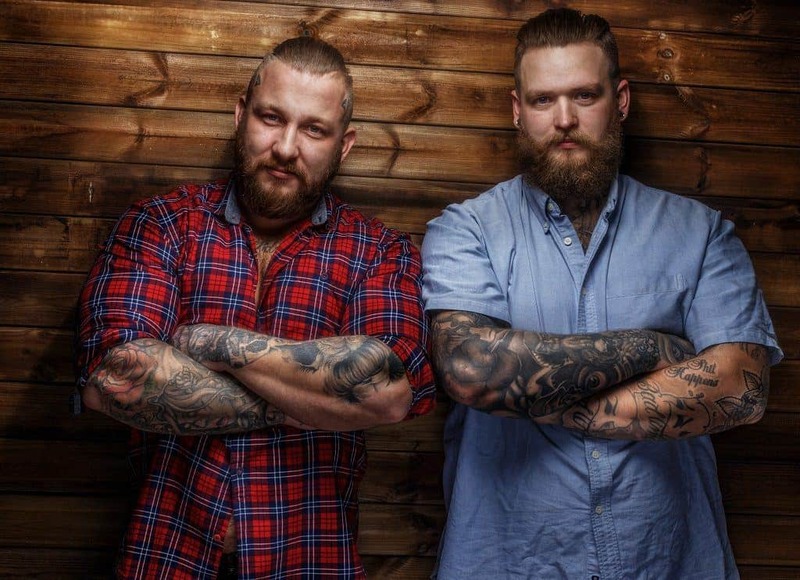 To date, it’s the largest facial hair styling competition in Scotland. Who Can Enter: Anyone with facial hair is eligible for entry – you don’t even have to be from Scotland! Categories: Best moustache, best partial beard. And yes, because this is Scotland, there is a best ginger beard category. Awards: While no prizes have been announced yet, all competitors will receive a gift bag. 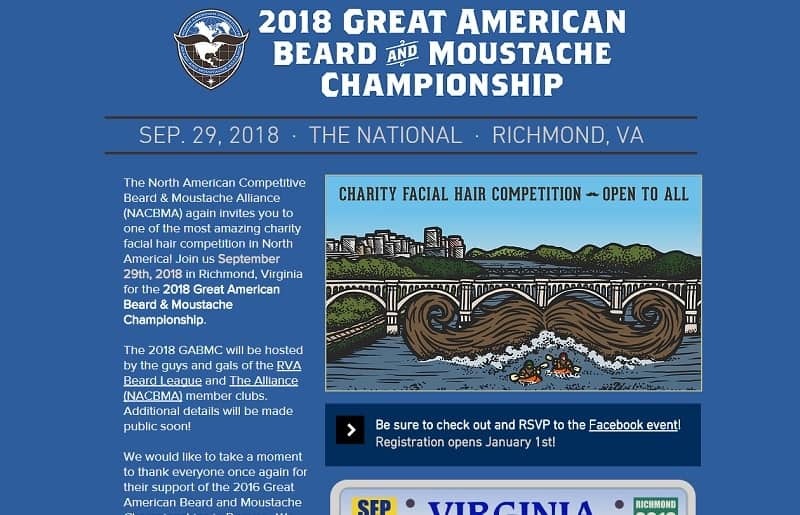 Hosted by the North American Competitive Beard and Moustache Alliance (NACBMA), the Great American Beard and Moustache Championships is a charity facial hair contest. With over 200 competitors at the 2016 event, the upcoming 2018 competition in Richmond, VA, is sure to be even bigger. Who Can Enter: Anyone with facial hair is eligible for entry. 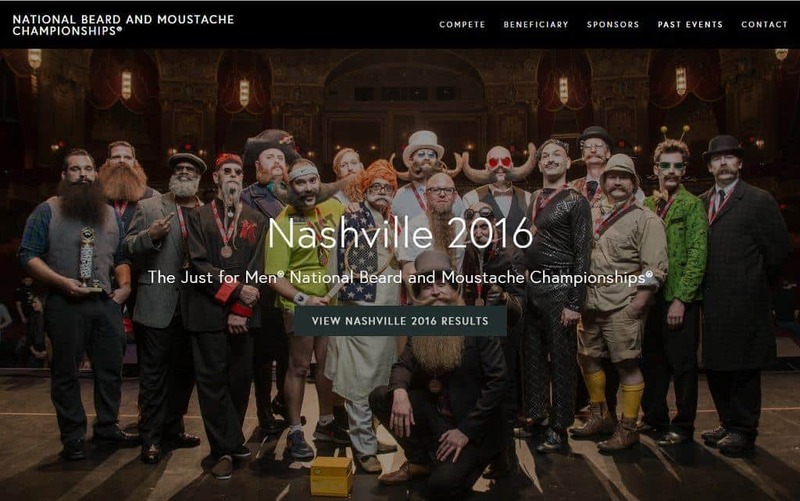 Categories: The 2016 competition had over 21 different categories, including categories for popular mustache styles like the English, Hungarian, Imperial Van Dyke, and Dali mustache. There are also more than half a dozen different partial and full beard categories. Awards: Charity is the main focus of the event, so no money is awarded to the winners. In February of each year, the Austin Facial Hair Club hosts the Come and Shave It beard contest to benefit a local charity. For over ten years, the event has been drawing in beard enthusiasts and curious onlookers alike for a day of food and fun. Who Can Enter: Anyone with a beard who pays the $20 competitors fee (with all sales going to charity) may enter. Categories: “Sweetest stash”, “gnarliest beard”, and most “pompous partial” are just three of eight different categories to compete in. Awards: Each category has one winner, but the charity event does not award cash prizes. Photos from: fxquadro / depositphotos.com, luismolinero / depositphotos.com.